BLACK+DECKER The Book of Home How-To is a comprehensive home reference book with all of the information you need to perform just about any home repair or improvement project you can dream of. And even though it boasts 600 densely packed pages of reliable DIY instructions, this brick of a book will still fit into your toolbox. This book is an A-to-Z encyclopedia with precise how-to instructions and clear photos on every page. With an expanded index of keywords that is intuitive and a simple, alphabetical strategy for organizing the information, you won't spend precious time wading through stuff you don't need to know. And all the most common tasks around your home are covered, including electrical, plumbing, flooring, walls, windows and doors, cabinetry, insulating, heating and cooling, roofing and siding, and much more. 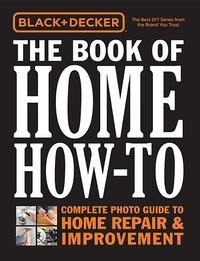 BLACK+DECKER The Book of Home How-To it's incredibly easy to use because it thinks like you do. Plus, it is portable so you can take it with you wherever the work is being done.